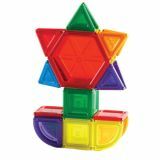 This set encourages color and shape recognition. The bolts only fit with the nut having the same shape. 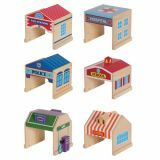 Includes 4 types of illustrated plastic activity cards(16 total) which hold up great for classroom use. Includes 36 of each nuts and bolts. Ages 2-5. 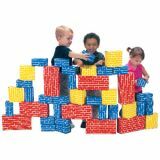 Imagine lightweight building blocks that are safe to stack to towering heights, quiet when they tumble down, eco-friendly and an absolute blast to play with. That sums up KORXX Eco-Rounds from ECR4Kids! Constructed with durable cork, these block sets have surprising building characteristics that gives them more flexibility than traditional hardwood, such as increased friction and a slight sponginess. 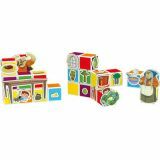 Provide an open-ended activity in classrooms, daycares or at home with this 14-piece set of unique, kid-safe blocks. Available with an attractive natural finish or in assorted colors. 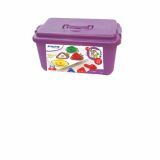 Includes a container for convenient storage when playtime is done. Recommended for children 3+. 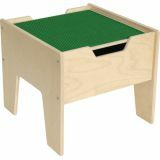 With a concentration on the Pre K-12 sector, ECR4Kids offers a wide range of products including classroom tables and chairs, preschool rest time solutions, hardwood storage cases, blocks and manipulative, mobile organizers and a variety of indoor and outdoor play structures. 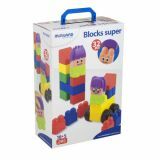 Big, robust blocks with round flexible pieces are the perfect first building blocks for little hands. Longest block is 71⁄8"L. Includes teaching guide with activities. Ages 1 1⁄2-3. An award-winning classic that offers endless play possibilities! Since they're constructed of lightweight corrugated cardboard, If the blocks tumble, no one gets hurt! 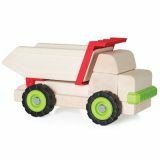 Blocks are printed with non-toxic inks and feature a water-resistant coating for years of creative play. Large blocks measure 12" x 6" x 3"; medium blocks are 6" x 6" x 3"; small blocks are 6" x 3" x 3". Ages 11/2 and up. 8 Large Red, 8 Medium Yellow & 24 Small Blue. Super-strong magnetic force creates a quick connect for fast, simple and powerful 3D modeling! 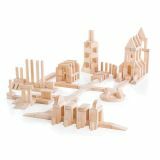 Trilingual Activity Guide gives young builders step-by-step instructions on how to create a variety of models while teaching them the basics of science, construction and engineering. 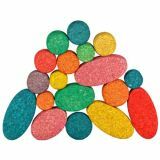 Solids are excellent for introduction to the basics of volume and mass, as well as color theory. New, improved LED lighting system displays brighter, whiter and more uniformly distributed light, uses less electricity, and produces less heat. They're even waterproof! 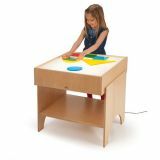 Illuminated surface is great for learning about shapes and colors. The LED lights are UL listed and guaranteed to last for 50,000 hours. GREENGUARD® Gold Certified. Made in the USA. Lifetime warranty. 25 1/2"L x 25"W x 24"H. Weight 44 lbs. Additional shipping charges apply. Brackitz is the only construction toy that lets you design any driving machine you can imagine. Anything. 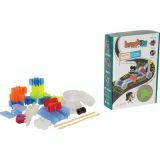 The Brackitz Driver Set includes 43 pieces and directions for ten driving machines - from a spinning gyro-copter to a space rover to a wind-up blaster. With wheels, axles, hubs and rubber-band drivetrains, engineers of all ages can design and build machines that spin, explore space, fly through the air, or drive crazy fast. No driver's license required!